A metalsmith or simply smith is a craftsman fashioning useful items (for example, tools, kitchenware, tableware, jewellery, and weapons) out of various metals. 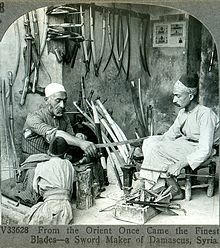 Smithing is one of the oldest metalworking occupations. Shaping metal with a hammer (forging) is the archetypical component of smithing. Often the hammering is done while the metal is hot, having been heated in a forge. Smithing can also involve the other aspects of metalworking, such as refining metals from their ores (traditionally done by smelting), casting it into shapes (founding), and filing to shape and size. The prevalence of metalworking in the culture of recent centuries has led Smith and its equivalents in various languages (German Schmidt, Portuguese Ferreiro, Ferreira, French Lefèvre, Spanish Herrero, Italian Fabbri, Ferrari, Ferrero, Ukrainian Koval etc.) to be a common occupational surname. As a suffix, -smith connotes a meaning of a specialized craftsman—for example, wordsmith and tunesmith are nouns synonymous with writer or songwriter, respectively. In pre-industrialized times, smiths held high or special social standing since they supplied the metal tools needed for farming (especially the plough) and warfare. A metalsmith is one who works with or has the knowledge and the capacity of working with "all" metals. A swordsmith is a bladesmith who forges only swords. The ancient traditional tool of the smith is a forge or smithy, which is a furnace designed to allow compressed air (through a bellows) to superheat the inside, allowing for efficient melting, soldering and annealing of metals. Today, this tool is still widely used by blacksmiths as it was traditionally. The term, metalsmith, often refers to artisans and craftpersons who practice their craft in many different metals, including gold, copper and silver. Jewelers often refer to their craft as metalsmithing, and many universities offer degree programs in metalsmithing, jewelry, enameling and blacksmithing under the auspices of their fine arts programs. Machinists are metalsmiths who produce high-precision parts and tools. The most advanced of these tools, CNC machines, are computer controlled and largely automated. ^ "Definition of METALSMITH". www.merriam-webster.com. Retrieved 3 April 2018. ^ "Definition of BLACKSMITH". www.merriam-webster.com. Retrieved 3 April 2018. ^ "Definition of BLADESMITH". www.merriam-webster.com. Retrieved 3 April 2018. ^ "A Survey of English Bynames: Brownsmith". medievalscotland.org. Retrieved 3 April 2018. ^ "Definition of COPPERSMITH". www.merriam-webster.com. Retrieved 3 April 2018. ^ "Definition of GOLDSMITH". www.merriam-webster.com. Retrieved 3 April 2018. ^ "Custom & Personalized Beer Glasses since 2005 by BeerGlassSmith". Etsy. Retrieved 16 April 2019. ^ "Definition of GUNSMITH". www.merriam-webster.com. Retrieved 3 April 2018. ^ "Definition of LOCKSMITH". www.merriam-webster.com. Retrieved 3 April 2018. ^ "Definition of TINSMITH". www.merriam-webster.com. Retrieved 3 April 2018. ^ "Definition of WEAPONSMITH". www.merriam-webster.com. Retrieved 3 April 2018. ^ "Definition of WHITESMITH". www.merriam-webster.com. Retrieved 3 April 2018. ^ "Definition of MACHINISTS". www.merriam-webster.com. Retrieved 3 April 2018. Look up smith in Wiktionary, the free dictionary. Wikisource has the text of a 1911 Encyclopædia Britannica article about Metalsmith. Wikimedia Commons has media related to Smiths.